Photo by Celeste Colon | Performers dance in lion costumes at NorthPark Center to celebrate the New Year Feb. 17. 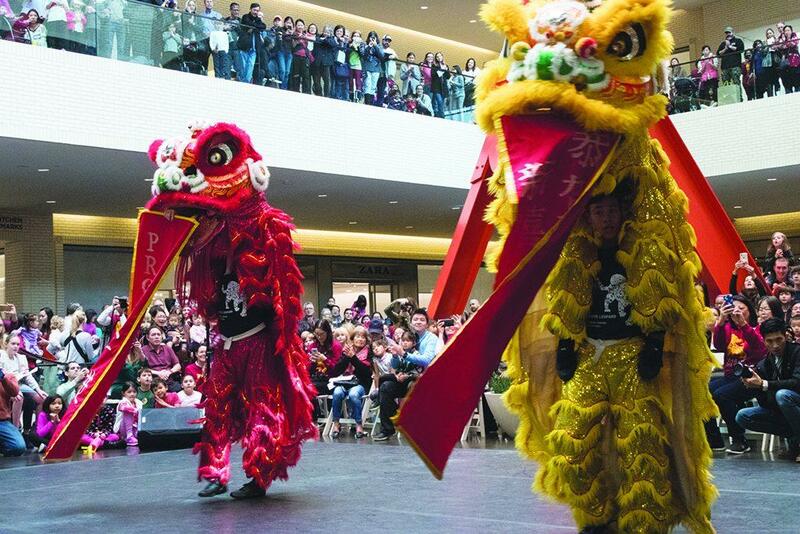 NorthPark Center was filled with art activities and demonstrations, including a main stage with performances by the Dallas Symphony Orchestra, traditional Chinese operas and dragon and lion dancers Feb. 17. “Kung hei fat choi,” or “Congratulations and be prosperous.” These words echoed through the festival as people wished each other a happy New Year, luck, cheers and good fortune. Crowds gathered at NorthPark to celebrate the Chinese New Year. It was a goodbye to the Year of the Rooster and a hello to the Year of the Dog – a year branded by loyalty, kindness and love. In celebration of the Lunar New Year, the Trammell and Margaret Crow Collection of Asian Art hosted its annual signature event. The celebration was originally planned for Klyde Warren Park, but due to rainy weather conditions, it was moved to NorthPark. People flocked to the main stage as drums roared. The crowd gathered around the stage on the first and second floors. There was a quick introduction while Lee’s White Leopard Kung-Fu school was led down the escalator sporting lion dance costumes. The crowd erupted in cheers and clapping. The performers danced through the sea of people, collecting money for good luck. Attendees had their faces painted with zodiac signs, learned about traditional Chinese dishes with toy food and practiced brush and ink painting. They also took photos with the lion dance costume heads and designed toy firecrackers. Attendees wrote wishes on red ribbons, which they tied to an interactive sculpture created by artist Jin-Ya Huang. This practice imitates a custom in Hong Kong where people would write wishes for the New Year and hang them on trees, according to Slate. Chunhua Zhan, a Brookhaven College student, said her family would traditionally hang long paper with brushed on wishes in front of their door. Zhan also said it is conventional to always wear new clothes on the first day of the New Year. As a nod to the Year of the Dog, the Crow Collection partnered with local Dallas-Fort Worth animal rescues and had puppies available for adoption during the event at the Zodiac Zoo booth. Some people even brought their own canine companions.“We believe that by involving local rescues in our largest festival of the year, the Crow Collection is able to give back to the community and raise awareness about foster and adoption opportunities in and around North Texas,” Alyssa Arnold, director of programs and engagement at the Crow Collection, said. “The Crow Collection’s Chinese New Year Celebration has always been one of the most vibrant cultural events in our community,” Kristen Gibbins, executive director of marketing strategy at NorthPark Center, said. The Chinese New Year begins Feb. 16. It is a holiday to honor household and heavenly deities and ancestors, according to history.com. It is also a time to bring family together for feasting. Weiguo Zhang, a Brookhaven student, said he and his family held a big party with at least 30 people and served Chinese cuisine. In the first five days of the New Year, people eat long noodles to symbolize long life. On the 15th and final day, round dumplings shaped like the full moon are shared as signs of family unity and perfection, according to history.com. Zhang also said work usually comes to a halt for the Chinese New Year. In preparation for the holiday, houses are methodically cleaned to get rid of “huiqi,” unfavorable and discouraging air collected during the old year. Offerings of food and drinks are placed on shrines dedicated to ancestors. Chinese celebrators burned incense sticks in temples to pray for good luck, and set off firecrackers at midnight because the loud noises were believed to scare bad spirits, according to history.com. In 1996, China instituted a weeklong vacation during the holiday – now called Spring Festival – giving people the opportunity to travel home and celebrate the New Year, according to history.com.